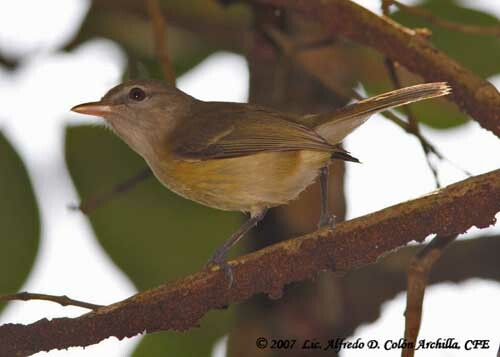 The Puerto Rican Vireo is endemic to Puerto Rico. It frequents various types of forests and is common in this habitat. It moves through the foliage when foraging in trees. Its Puerto Rican name, “Bien-te-veo”, comes from its melodious song. 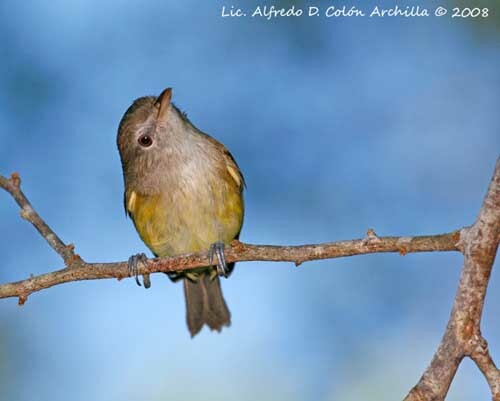 It is also named Latimer’s Vireo, and this name pays tribute to George Latimer, consul to Puerto Rico in the 19th century. The adult has greenish-grey upperparts. On the upperwing, primaries and secondaries are dark grey with yellow-green edges on the outer webs. The upperwing-coverts are grey-green with indistinct yellowish edges. The tail is grey-brown and the rectrices show olivaceous edges. On the underparts, chin and throat are greyish-white and the breast is yellowish-grey. The belly is yellowish, paler in centre and duller on flanks. The vent is yellowish too. On the head, crown and nape are greenish-grey but duller than the back. We can see whitish eyering, area around the eyes and above the lores. The bill is dark horn-brown above, but the lower mandible is paler. The eyes are brown to reddish-hazel. Legs and feet are bluish-grey. The juvenile has two brownish wingbars on closed wings. The underparts are white, turning yellow-olive on flanks and vent. 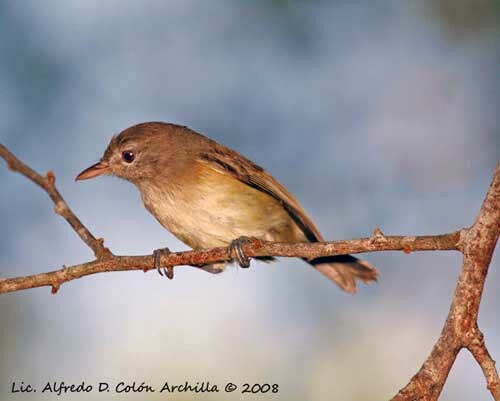 The Puerto Rican Vireo is found in W and C Puerto Rico. 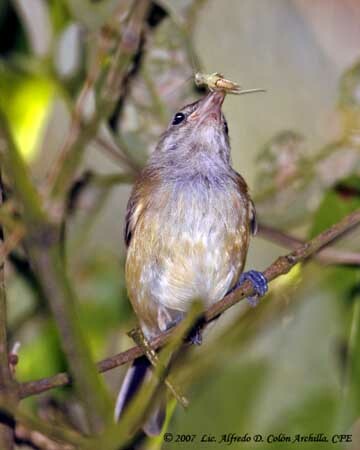 The Puerto Rican Vireo frequents dry coastal shrub, wet forests in mountain and limestone hills, some coastal mangroves and shade coffee plantations. 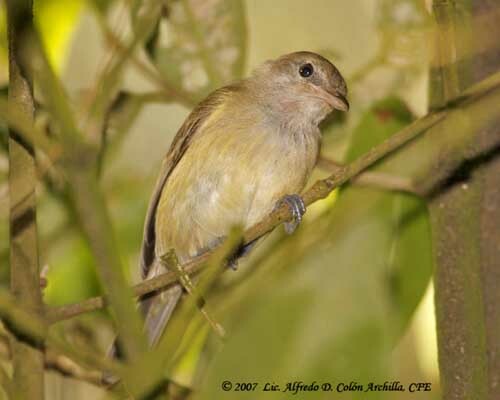 The Puerto Rican Vireo utters a rattling “chur-chur-churr” used during courtship displays. It also gives a “tup tup tup” as contact call, and a hoarse, raspy mew. The song is a melodious whistle of 3-4 syllables, repeated during several minutes interspersed with pauses and followed by different repeated motif described as “bien-te-veo”, giving the bird its name. This sound is frequently uttered while the bird is foraging among the mid-level vegetation. The Puerto Rican Vireo is an insect-eater and feeds mainly on insects such as grasshoppers, caterpillars, cicadas, beetles and aphids. It also takes spiders, small lizards and berries. It forages at all levels and out of sight, moving among the vegetation in methodical manner. During the breeding season, it becomes strongly territorial and frequently attacks intruders, flying at them until body contact, with locked bill and feet, and falling together to the ground. They use a repertoire of visual displays according to the circumstances. The crest can be raised, the spread tail is lowered and the bill is wide open. Both male and female use these aggressive displays in front of predators. More information is needed about courtship displays, but we may suggest they are fairly similar. 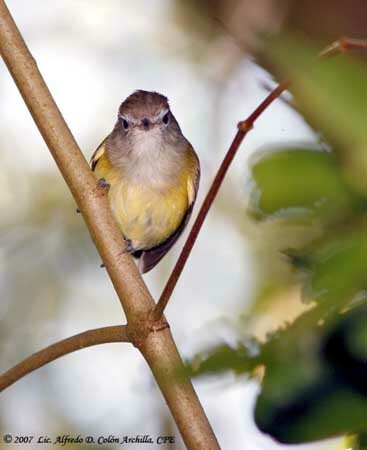 The Puerto Rican Vireo is sedentary and only performs some short flights between territories. Usually, the adults remain on their territory, whereas the young birds disperse up to two kilometres. As resident species, it has broad, rounded wings, and flies only over short distances. The breeding season occurs mainly from March to June, according to the rainfall. The pair usually renests after failures, sometimes up to six attempts in a season. Both adults build the nest, a deep cup made with dry grasses, vegetal down, hair and other similar items. The outer side is decorated with moss and spider webs. The nest is placed in bush, in lateral fork or on branch in tree, not very high. The female lays 2-3 white-pinkish eggs with dark markings. There is no information on incubation and nestling period, but the young birds remain fairly long time on their natal territory. The nests are often parasitized by the Shiny Cowbird. 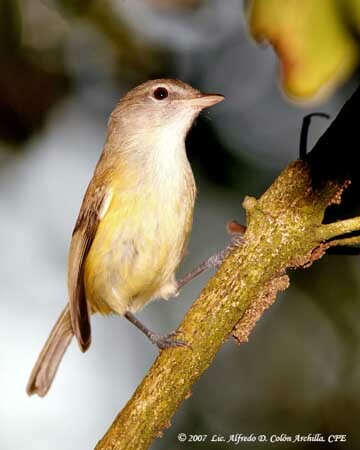 The Puerto Rican Vireo has restricted range but it is common in most parts of the habitat. However, this species is vulnerable to introduced predators and suffers heavy brood parasitism. 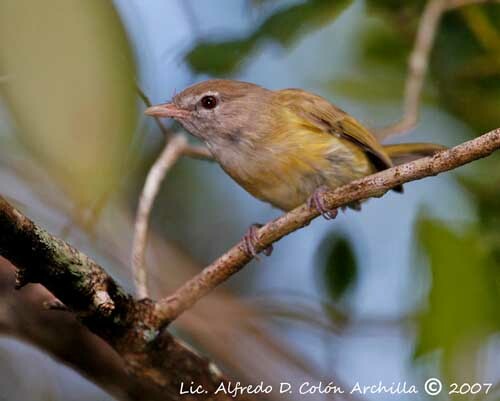 But currently, the Puerto Rican Vireo is not is not globally threatened.